SEATTLE–(BUSINESS WIRE)–Today Remitly, the largest private digital remittance company headquartered in the United States, announced it has released an update to its money transfer service to India. The update moves its daily sending limit to $30,000 on money sent to India from the United States. The company also announces it has enlisted critically acclaimed Bollywood actor, R. Madhavan as its brand ambassador. Remitly helps individuals in the United States, United Kingdom, Canada, and Australia send money to India easier, faster, and at a lower cost. The company remains committed to India’s overseas community as evidenced by its growing partner network of over 150 banks for receivers in India and its recent update to the U.S. to India daily sending limit. Remitly is the largest independent digital remittance company headquartered in the United States, transferring $5 billion in annualized volume from its customers in the United States, United Kingdom, Australia, and Canada to loved ones throughout the world. The company’s proprietary global transfer network includes its easy-to-use mobile app, which makes the process of sending money faster, easier, more transparent, and less costly by eliminating the forms, codes, agents, extra time and fees typical of the traditional, century-old money transfer process. Remitly is backed by industry-leading investors Naspers’ PayU, World Bank’s International Finance Corporation (IFC), Silicon Valley Bank, Stripes Group, DFJ, DN Capital, QED Investors, Trilogy Equity Partners, Bezos Expeditions, Founders’ Co-Op, and TomorrowVentures. The company is headquartered in Seattle, with additional offices in London, the Philippines, and Nicaragua. For more information, visit Remitly.com. R. Madhavan is a critically acclaimed actor known most notably for his roles in Rehna Hai Tere Dil Mein, Alaipayuthey, Guru, 3 Idiots, Rang de basanti, Vikram Vedha, Tanu Weds Manu, and the new web series, Breathe. 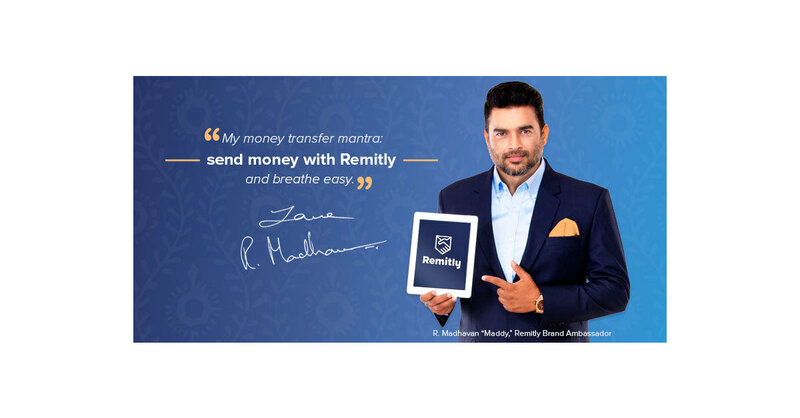 R. Madhavan joins Remitly as a brand ambassador as the company continues its international expansion efforts to bring its service to more overseas Indian communities worldwide.